I am a huge fan of flowers, I love to have them in the house and I think they can brighten your mood considerably, and I especially love using them to decorate the table when we have friends and family over. The Academy have many different arranging courses and their one day ‘Table Arrangements for Entertaining’ course was the perfect choice for me! It was the perfect day to visit the Academy as it was their 4th birthday and to celebrate there was cake, made by one of the Academy staff, Cedric. We began our class with introductions and then a potted history of the Academy given by the Principle herself, Gillian Wheeler and a little health & safety chat from Madeline. Gillian’s ambition for each student is that they leave the Academy with the confidence to make beautiful arrangements. Her passion for what she does really shines through and was completely infectious. I couldn’t wait to get started! We started with the basics of how to soak oasis (the green foam block you poke flowers into to allow you to arrange them). This was fascinating me to as apparently I’ve been doing it wrong all these years! Then we launched into the arranging itself. Using a round oasis block Gillian gave us a demo of roughly where to place foliage. The Academy doesn’t force any of the students to conform to one particular style, they give you the technical basics and allow your creative skills to take over. There were many different varieties of foliage and flowers to choose from, resulting in some beautifully different arrangements. The efforts of my classmates. After an hours’ lunch break Gillian showed us how to display our arrangements – taking them from simple & beautiful table decorations to something a bit more eye catching, and in some cases simply spectacular, and all with items you may have at home. For example, a cake stand, who’d have thought? Another cake stand, this time with a candle in the middle. Or a large martini glass filled with purple water to reflect the purple roses used? Similar one here. Next up was something very appropriate for the day, Halloween. We were asked to choose a gourd or mini pumpkin from the Academy shop to create a teeny and very cute arrangement, perfect for a place marker. I went for a pale yellow mini pumpkin. We filled them with soaked oasis and decorated with an assortment of foliage, berries and even mini chili peppers. Finally we made wired roses and leaves, something that can be very tricky to master. We learnt how to wire the leaves so they can be bent into different positions and how to wrap the stems in gutter tape, something that will take a little bit of practise! These arrangements can then be made into napkin rings, place markers, button holes and many other things, so a handy skill to have if you can master it! After a long but incredibly fun day, it was time to sing Happy Birthday to the Academy and sample the beautiful cake! I had such a fantastic day at the Academy, and have already hinted to the other half that a course would make a great birthday or Christmas present! And it didn’t stop once I got home, I practised my arranging skills there too. Another use for my cake stand! 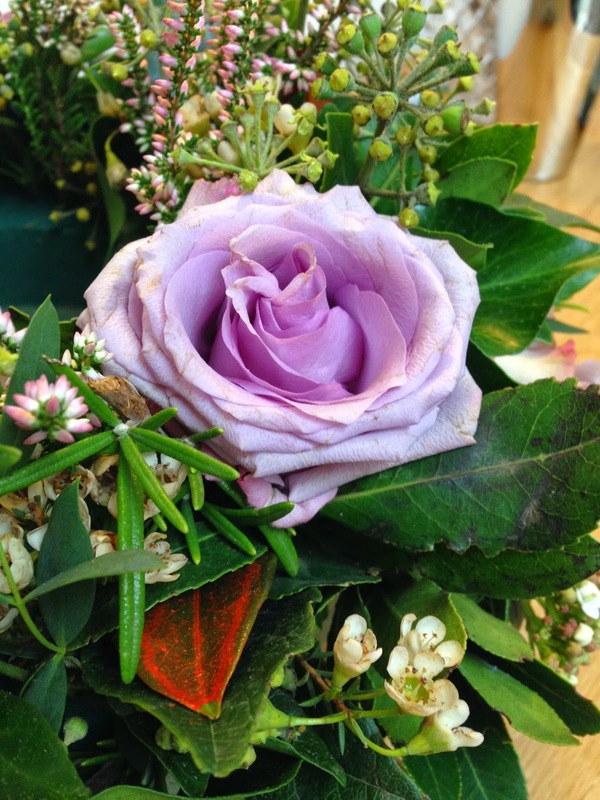 The Covent Garden Academy of Flowers runs all sorts of different courses. From evening courses of a couple of hours, to full days and even Diplomas in floristry. Courses start at £110, with the ‘Table Arrangements for Entertaining’ course costing £220. It may sound a lot initially but all your foliage, flowers and equipment is included, you also benefit from the knowledge and experience of some of the best florists around – something you can’t really put a price on, plus you get to take your arrangements home at the end of the day too. If you’re interested in flowers, entertaining or just fancy learning a new skill, pop a course with the Academy on your Christmas list this year (or even hint before and go to their Christmas Course, starting November 27th) I promise you won’t regret it!